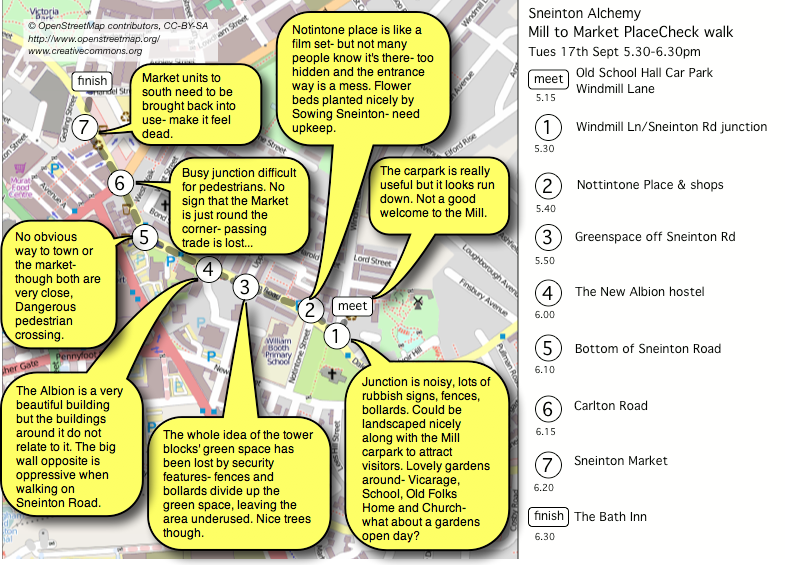 The second of Alchemy's planned series of PlaceCheck walks around the area took place on Tues 17th September. 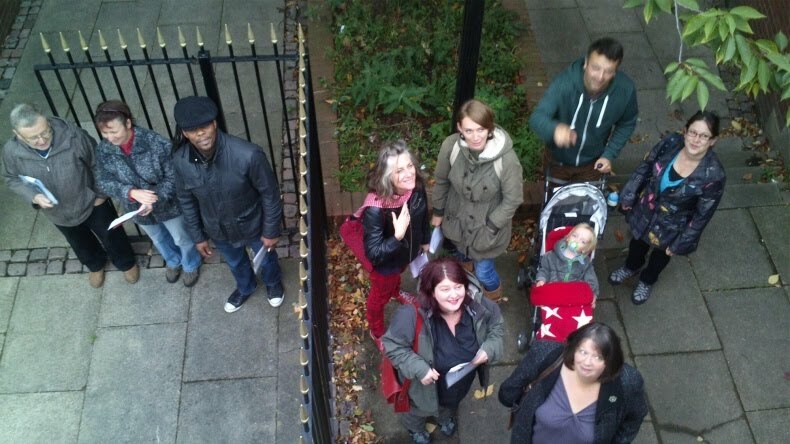 A group of 13 people set out to explore the area between Green's Mill and Sneinton Market. These are the two best known Sneinton landmarks, but it turns out the route in between them is one of the worst designed parts of the whole area. This is the gateway to Sneinton from the city, and the route taken by most Sneinton people as they travel in to town. There are many attractions: the listed Albion building and Notintone Place in addition to the working Green's Windmill and the newly refurbished Sneinton Market and Victoria Leisure Centre... and plenty of green space and trees. However the overall feeling is unfriendly and bleak, particularly along Sneinton Road and at the traffic junctions of Windmill Lane, Eyre Street and Carlton Road. Above: Some of the comments gathered during the PlaceCheck walk. The whole area was re-planned in the 1960s, leading to the demolition of much 'slum' housing and its replacement with tower blocks and modern terraces. This was a bold move to improve the area and had great intentions behind it, but the urban planning ideas of the time have proved to be insensitive to how people actually want to live. The idea of tower blocks surrounded by parks, bringing light and air into overcrowded areas quickly failed due to security problems, and the whole area around Sneinton Road has been divided up by low rise buildings and security fences. With the old street pattern destroyed by the 1960s plan, and the open space now divided up, the area is hard to get around and, though safe enough, feels unfriendly and threatening. Sneinton Market has been in the press a great deal recently- with controversy over the ownership of the buildings, the run down condition of the 1930s market units and the amount of money spent on the underused Sneinton Market Square and Victoria Leisure Centre. While the political and commercial arguments about the future of the area rage on, local people want to see their beloved market return to health and local businesses need to plan for the future. This area of Sneinton has a lot to offer but a plan for improvement is urgently needed so that some of the potential can be realised for the benefit of the community. That is the Sneinton Vision!